Silver Steps™ antibacterial gel tubing trims to fit, cushioning against the pain and friction of calluses, corns, scars, blisters and ingrown nails. 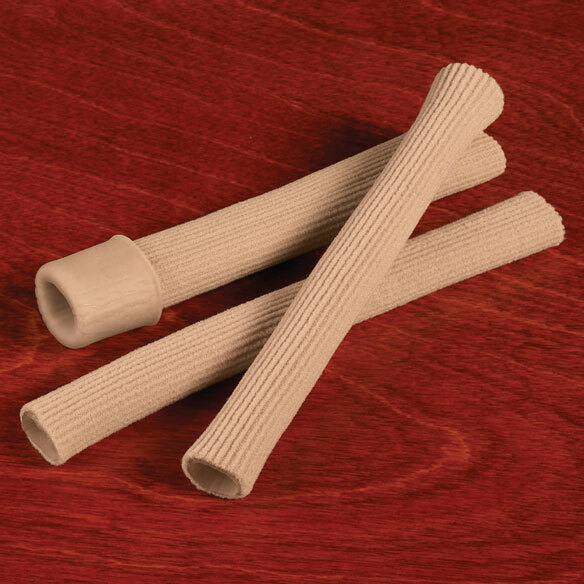 Toe protector tubes have ribbed-knit outside and a soft gel padding inside. Antimicrobial treatment fends off harmful and odor-causing bacteria. Washable and reusable. Specify size: Wide (1"dia. x 6"L) or Narrow (3/4"dia. x 6"L). One pair. They protect my toes from getting blisters I couldn't live with out them. Pain walking I put on toes. soothing comfort for sore toes. comfortable between toes for corns or to separate hammer toe from one beside it. I ;have been using these for years and they give me relief from sore toes. Hammertoe with ulcer on top. These were recommended by our podiatrist. I have problems with my feet and toes, and this will afford me more comfort. It's exactly what the foot doctor told me to use to straighten my toe and give me relief from pain. I used to use individual corn cushions. I find these much more economical to use, as I can wash in cold water and reuse multiple times. I also like that I can cut the tubes to the length that works best for me. I have to have to cover three toes on each foot. I cut these tubes into lengths to fit the bars in my jewelry holder, so as to give a cushion to my necklaces. I need to protect my big toe. Gel-lined tubes easy to put on, can be washed, and they work well to separate sore toes. I recommend them! I have bought this product several times before and it helps me . Needed for pinky toe. I keep losing them and this give me more and the option to cut to right size. This will be my first time trying this product. A friend uses these and swears by them. How many rolls come in this order? BEST ANSWER: Thank you for your question. You will receive a pair of these rolls.We hope this information will be of help to you. does this have latex in it?